clean, friendly, good location for olympia stay downtown. older hotel needing some upgrades. breakfast was ordinary but adequate. Where to find Olympia hotels near an airport? Where can I find hotels in Olympia that are near tourist attractions? Looking for a comfy place to base yourself in Olympia? Expedia's accommodation network currently includes approximately 18 accommodations within a 0.1-kilometre (0.06-mile) distance of the town center. Those searching for a great place to stay conveniently located to the heart of Olympia, can choose from the DoubleTree by Hilton Hotel Olympia and The Governor, a Coast Hotel. Lacey is a great area in which to base yourself because it has 8 hotels that can be booked through Expedia. Lacey is 6 kilometres (4 miles) from the middle of Olympia. 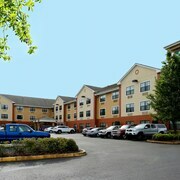 The Holiday Inn Express Hotel & Suites Lacey and Candlewoods Suites Lacey are some of the hotels in this area. Another popular area is Tumwater. This area is 6 kilometres (4 miles) from the middle of Olympia. 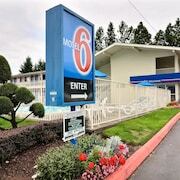 There are 6 establishments in Tumwater, including the Comfort Inn Conference Center and Best Western Tumwater Inn. The Expedia team understand that travelers have varying budgets and needs. So if you are searching for accommodation at the more affordable end of the scale, the Olympia area boasts some solid options. The Best Western Tumwater Inn is 5 kilometres (3 miles) from the heart of Olympia, while the Quality Inn & Suites Lacey is 6 kilometres (4 miles) away. Two more options in the budget range of Olympia include the Extended Stay America Olympia - Tumwater and the Shelton Inn. 30 kilometres (18 miles) from the center of Olympia, is the Great Wolf Lodge Grand Mound. The Best Western Liberty Inn DuPont is 20 kilometres (13 miles) away. 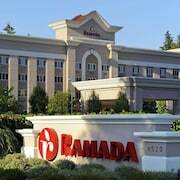 Alternatively, check out the amenities and rates at the Ramada Olympia or the Hotel RL Olympia by Red Lion. Looking to go a little further afield? Puget Sound has a number of options. Puget Sound has forests and fjords, and common Puget Sound sights include lighthouses. Adventurous travelers may also try their hand at hiking and quad biking here. Looking for more things to do? Spend the day discovering Space Needle and Pike Place Market, in Seattle, 75 kilometres (47 miles) to the northeast of Olympia. The Four Seasons Hotel Seattle and Seattle Marriott Waterfront are a few of the Expedia-listed apartment and hotel options in Seattle. Or, you could stay in Lacey, 6 kilometres (4 miles) to the east of Olympia, where you'll find the La Quinta Inn Olympia-Lacey and Comfort Inn Lacey - Olympia. The Stottle Winery Tasting Room and Madsen Family Cellars are a couple of the most popular sites to explore when you're in Lacey. For travelers planning on flying via Seattle - Tacoma International Airport, you may find it convenient to book a bed at Seattle Airport Marriott, or Cedarbrook Lodge, both of which are nearby. What are the most popular Olympia hotels? Are there hotels in other cities near Olympia? What other types of accommodations are available in Olympia? Explore Olympia with Expedia.ca’s Travel Guides to find the best flights, cars, holiday packages and more!